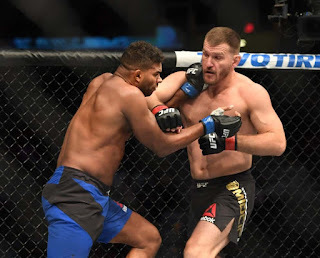 After a dominant five-round beatdown at UFC 220 of the so-called "Scariest Man On the Planet" Francis Ngannou, UFC Heavyweight Champion Stipe Miocic is now the most decorated heavyweight champion in UFC history. He's the first man to have defended his title three times in a row, and based on his 50-44 rout of Ngannou, it looks like he's getting even better and better and won't be slowing down anytime soon. 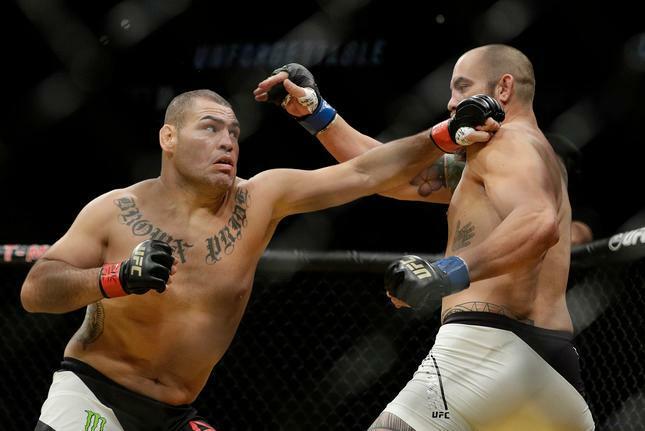 At this point, he's essentially cleaned out the division, but one man remains for him to fight: Cain Velasquez. Miocic vs. Velasquez is pretty much the only fight that makes sense right now. If you look at the UFC's heavyweight rankings, Miocic has already defeated most of the top guys. 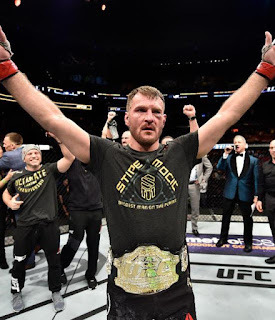 He just dominated Ngannou, he knocked out Fabricio Werdum to win the title in the first place, he knocked out Alistair Overeem to defend the title, he knocked out Mark Hunt on his way to the title, he destroyed Andrei Arlovski, and though he isn't ranked because of suspension, Miocic also knocked out Junior dos Santos. The bottom half of the rankings features guys like Derrick Lewis, Marcin Tybura and Alexander Volkov, who are solid fighters, but definitely not title contenders. There's a possible rematch with Stefan Struve one day, but as the years go on, that TKO win he has over Miocic looks more and more like a major fluke. So by default, Velasquez is the only guy who really makes sense. Yes, it's true that Velasquez hasn't fought in the almost two years since his a TKO win over Travis Browne, but when he was active and fighting, most considered Velasquez the best heavyweight in the world, and one of the greatest ever. After knocking out Volkan Oezdemir in the co-main event, UFC Light Heavyweight Champion Daniel Cormier said Velasquez, his long-time teammate at AKA, would be returning to the Octagon soon. And while ideally Velasquez would get a tune-up fight, it's just not feasible considering the lack of depth in the heavyweight division. If he's healthy, Velasquez is going to have to fight Miocic and determine who the best heavyweight of their era is, because right now it's pretty much down to those two guys. (Fedor Emelianenko, of course, is still regarded as the best of his generation. If it isn't Velasquez, it's possible a rematch between Miocic and Werdum could happen, because Werdum is one of the few heavyweights coming off of a win streak. But it would be better to have a fresh fight. There's always the possibility that Brock Lesnar returns and gets an immediate title shot -- and that fight would draw huge numbers -- but it doesn't really make sense, considering Lesnar is coming off of a PED suspension. Jon Jones is in the same boat -- while a fight between Jones and Miocic would be amazing, there's no guarantee Jones fights for a few more years. So really, there just aren't many options, unless Cormier wants to move back up to heavyweight and fight Miocic. And that doesn't seem likely at all, given that he likely wants his teammate Velasquez to recapture the belt. So there's almost impossible to argue against the idea that Miocic vs. Velasquez is the fight to make. One, it's an intriguing matchup; two, it's a fresh fight; and three, it will determine the best heavyweight of the 2010s. Although under ideal circumstances, Velasquez should get a tune-up fight in his return, these are far from ideal circumstances; there's just no time for all that. Let's hope that Velasquez is finally healthy enough to fight again, so the UFC can book this fight. It has the potential to be epic, and end up as one of the best heavyweight fights ever.